A good source of protein and bone-building calcium, cheese can certainly have a place in a well-balanced diet. Moderation is key, however, because cheese also contains cholesterol and saturated fat, both of which can raise your blood cholesterol levels. Learn the cholesterol content of various cheeses to help you stick to the daily 300-milligram limit recommended for healthy adults or the 200-milligram limit for those following a low-cholesterol diet. An ounce of low-fat cheddar cheese contains just 6 grams of cholesterol, making it one of the lowest-cholesterol choices. For comparison, an ounce of regular cheddar cheese contains 30 milligrams of cholesterol, which is equal to about 10 percent of the daily limit of cholesterol for healthy adults and 15 percent of the limit for individuals following a low-cholesterol diet. Other lower-cholesterol choices include an ounce of part-skim mozzarella cheese, which contains 15 milligrams -- compared to whole mozzarella's 22 milligrams -- and an ounce of provolone cheese, which has 20 milligrams of cholesterol. 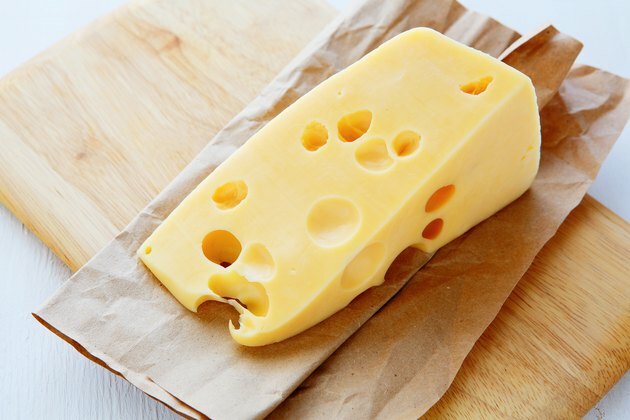 An ounce of Swiss cheese is another lower-cholesterol option with 26 milligrams. Low-fat cheeses have the lowest amount of cholesterol. An ounce of feta cheese contains 25 milligrams of cholesterol, making it one of your best choices in the soft cheese category. A tablespoon of cream cheese or an ounce of cheese spread each has even less with 16 milligrams of cholesterol. A 1/4-cup serving of cheese sauce contains 18 milligrams of cholesterol. Cottage and ricotta cheese tend to be higher in cholesterol than other soft cheeses, with 36 grams and 125 milligrams per cup, respectively. The amount of saturated fat in cheese is another concern. A diet high in saturated fat can increase your overall cholesterol levels, according to the American Heart Association. For that reason, you should limit your intake of saturated fat to 7 percent or less of your total caloric intake, the AHA recommends. An ounce of cheddar cheese, for example, contains about 6 grams of saturated fat. Opting for low- or reduced-fat cheese not only cuts your cholesterol intake, but it also lowers how much saturated fat you consume. If you do go with full-fat cheese, adjust the rest of your diet accordingly so you're not going over your daily limits. Another way to cut how much cholesterol and saturated fat you consume with cheese is to use less. Sprinkle a small amount over tacos or burritos, and cut the amount in casseroles and other recipes by one-quarter to one-half.